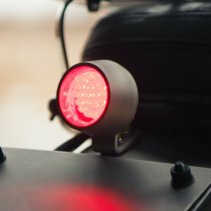 Analog Motor Goods has developed a compact super bright LED turn signal. We have developed these special plug-and-play kits for your Bonneville T100 and T120 front signals. The Analog Signal Pods are powerful mini indicators that are discreet until illuminated. Their low profile and robust construction keep them on par with the rest of the quality parts we here at Analog Motor Goods are known for. Pairs well with the Retro Lighting Kit. Manufactured by Denali Electronics. These are great replacements for the best selling Watsen Design ST indicators, from the now closed Watsen Designs. Fits Bonneville T100/T120 front turn signal Mounts. May fit rear but we have not tested.